The titles of pictures made by the Photo-Secessionists are frequently puzzling. 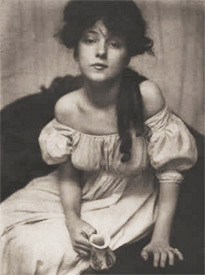 It cannot be assumed that the woman in the picture reproduced here (the last photo titled "The War Widow") was actually a war widow, or even the child's mother; photographers like Gertrude Kasebier loved to make photographs that were essentially, and frankly, fictions. Certainly adequate precedent had been set by Julia Margaret Cameron, who had photographed Sir Henry Taylor not only as himself but as Friar Laurence, with Juliet, as Prospero, with Miranda, and as Ahasuerus, with Queen Esther. One is tempted to believe that if the woman had been a war widow, Kasebier would have considered it tasteless to say so, in which case the picture might have been entitled "Elegy". Today we are perversely charmed by the sentimentality and naivete of the picture's nominal content. The picture's true content, however, has to do less with widowhood than with the visual mechanics of picture construction. On these grounds it is a highly sophisticated and challenging picture. One's immediate response to the photograph is that something is out of joint; the effect is upsetting, even menacing. On analyzing the picture visually we note that it is composed of two closely related light forms on a dark ground. 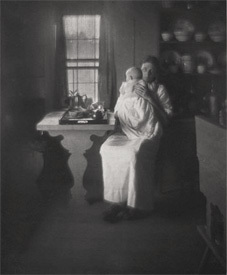 One is created by the white dresses of the woman and child, the other by the overlapping shapes of the table and window. The window and table read as a single form --- an opening, or negative space. As a result the dark shapes surrounding the table leg become positive, or projecting, forms. The signals from our eyes contradict our knowledge, and it is only by an act of will that we can maintain a rational orientation to the picture's very ambiguous space. 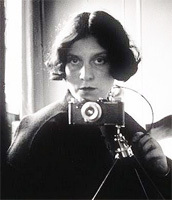 It is not necessary to assume that Kasebier analyzed the question in these terms. It is more likely that she saw the image upside-down on her groundglass and said to herself: "That is a very strange and interesting design". This is the first book about the pioneering photographer Gertrude Kasebier. 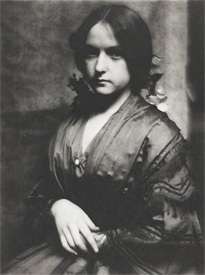 In middle age, with three grown children, she began to study painting and photography, set up a portrait studio on New York's Fifth Avenue, and became one of the finest and best-known portraitists and photographic artists of her day. 116 illustrations. This catalogue for an exhibition held at the University of Delaware draws on the extensive collection of her photographs and papers at the university, bringing together a range of specialists to re-examine her work as a whole for the first time in two decades. The catalogue features many previously unpublished photographs, as well as newly published texts by Kasebier drawn from the Special Collections holdings of the University of Delaware Library. This book offers a long overdue contribution to the study of this important photographer viewed within her cultural context. 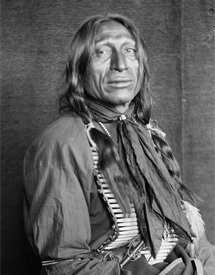 For the first time ever, here is renowned photographer Gertrude Kasebier's haunting collection of photographs of Native American performers from Buffalo Bill's Wild West show at the turn of the century. One hundred years later, Kasebier's portraits remain significant visual records into the lives of these Sioux performers and their nation. Her striking photographs capture the strength and character of each individual, documenting the complexity of true warriors playing a staged version of themselves.